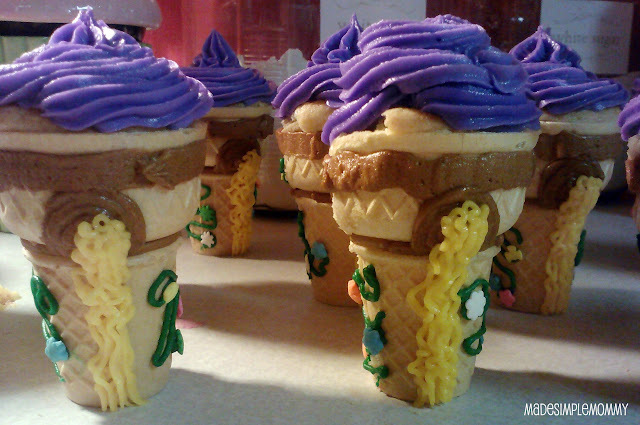 This is the "how-to" for Rapunzel cupcake #2! The request was for Rapunzel's Tower. Ice cream cones make the perfect tower! Its just the decorating part that is so many different options. I chose the "let your hair down!" with the golden locks flowing out the window with flower vines creeping up the sides of the cone. They get soggy. Don't make them more than a day in advance because they will cone will absorb the moisture and won't stand up well on its own any more. 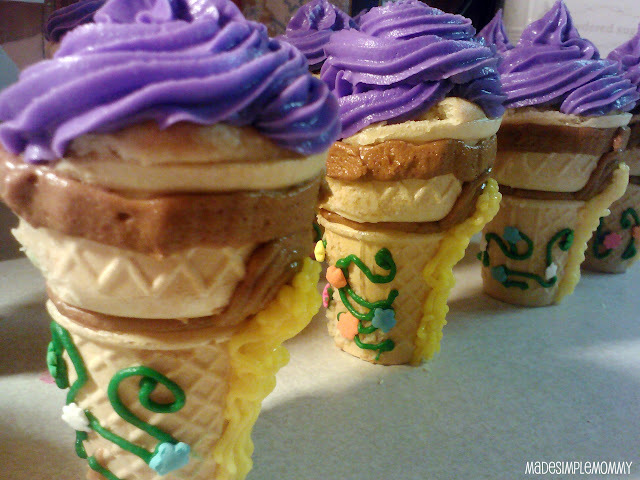 Fill the cone just 2/3 full with the batter, as they rise a lot, and will overflow easily. Really prepare yourself for transporting if doing so. Since the cone is decorated also, transporting in a box with holes in the bottom for the cone to slide through won't work. I put a large glob of frosting at the bottom of each cone and stuck it into a bakery cake box. It seemed to work well! For the cake I used my favorite white cake recipe. It is simple and starts with a cake mix! YES! You can find my favorite stand-by white cake recipe here. 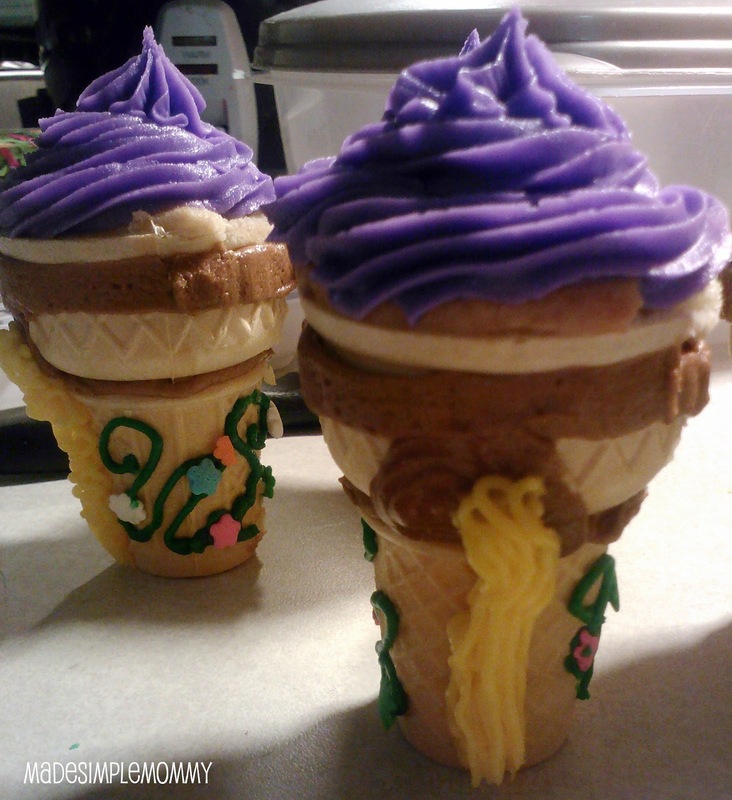 And then my favorite buttercream frosting here, on my previous Rapunzel Cupcakes. I made purple, yellow, green and brown frosting for these tower cupcakes. For the flowers I used a jar of "snowflake" sequin sprinkles and they worked out great! For decorating with multiple colors you can check out my favorite frosting tip blog post if working with a limited number of decorating bags. I did this to all the cones, and then changed the tip to the round 4. I followed the smaller bottom rim of the cone all the around also. I then chose a spot to create a small window and filled it in with the brown. I then changed over to the green frosting and the round tip 3. Randomly make vine-looking designs around the base of the cone, leaving a blank space under the window for the hair to be piped on. Wherever there might be a smudge or a thick frosting spot, place the "snowflake" sprinkles to look like flowers growing randomly on the vines. Now change to tip 233 and yellow frosting. Starting at the window opening start piping the frosting and create enough frosting to make it stick and hold well, do not let the frosting break, and pull down the side of the cone. I kept it pretty close and let it pile up in some spots to create a slight wave in the hair. Pull away towards the bottom to break the frosting chain.